[prMac.com] publicspace.net is pleased to announce the availability of MacBreakZ 4.4. 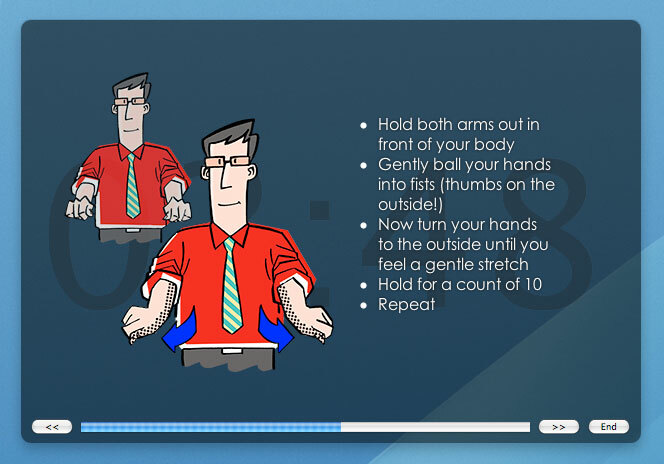 MacBreakZ is a sophisticated Personal Ergonomic Assistant designed to promote healthy and productive computer use. It has long been the rest break timer of choice for many Macintosh users having received a 4 mice rating from MacWorld as long ago as September 2002. Version 4 is a re-design based on almost 10 years of experience and feedback from our users. The product was entirely re-implemented in Mac OS X's native Cocoa environment to offer a best-of-breed user experience. MacBreakZ offers a unique way of acquiring ergonomic skills that can save users a great deal of discomfort and shield them from serious health and career-threatening disorders. The latest release now ignores the "fake" user activity produced by Apple's DVD Player application and allows users to enjoy their DVDs without interruption.